No respectable visitor comes to Martha's Vineyard island without a swim suit. The beaches are fine, the summer water not too cold. Martha's Vineyard is an island! Surrounded by water! The three major towns of Vineyard Haven, Oak Bluffs and Edgartown all have town beaches open to everyone, and there's a good beach at Menemsha (but very little parking), and another at Aquinnah, but otherwise the smaller towns and villages may reserve their beaches for local property owners, or charge a beach-use fee. Moshup Beach (Aquinnah Public Beach) is the stretch of sand extending southeast from the colored clay cliffs to Philbin Beach. There's parking (for a fee) near the cliffs, and a path for the 10-minute walk to the beach. East of the cliffs on the way to Chilmark, Lobsterville Beach faces Vineyard Sound, and there's some parking, but very little. This is a great destination to get to by bicycle. You can walk to Lighthouse Beach—and you should walk because there's nowhere to park. Walk northeast on North water Street to Starbuck Neck Road, which leads to Edgartown Light (you'll see the lighthouse). Fuller Street Beach is the northern extension of Lighthouse Beach. Walk northeast along Fuller Street to the end, where there's access to the beach. 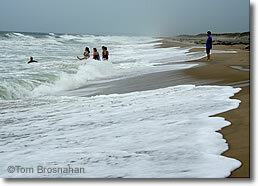 The Joseph A Sylvia State Beach, a two-mile (3-km) beach with Nantucket Sound to the east, Sengekontacket Pond to the west, is on Beach Road between Oak Bluffs and Edgartown. It's probably the first beach you'll see, whether you take a bus along the road or a bike along the bike path. Bend-in-the-Road Beach is the name of the Edgartown portion. You can access the beach from the bike path, and there's parking for cars. South (Katama) Beach at Norton Point (map), 3.5 miles (5.6 km) south of Main Street, is a l-o-n-g barrier beach washed by the surf, great for a refreshing, vigorous splash and some sun time. Cross the channel to Chappaquiddick for a bike ride or nature walk in the two unspoiled nature areas, Wasque in the southeast and Cape Pogue to the northeast, with East Beach in between, owned and maintained by the Trustees of Reservations. Right next to Menemsha Harbor is Menemsha Public Beach, on Vineyard Sound: convenient to the village (and its restaurants), gentle surf, and—if you stay till evening—a fine sunset. Facing east toward Nantucket Sound, Oak Bluffs Town Beach is supremely convenient: just look south from the Stemship Authority ferry docks from the town center along the road to Edgartown and there's the beach, which extends southward to where the Joseph A Sylvia State Beach begins. Take Beach Road toward Vineyard Haven to reach Eastville Beach, just before the drawbridge. Long Point Wildlife Refuge, a property of The Trustees of Reservations, has South Beach, a long stretch of sand sloping down to the churling Atlantic Ocean. —Thumb Point Road, the off-season (mid-September to mid-June) entrance, 1.3 miles (2 km) from Scrubby Neck Road to the Visitor's Center and parking area, then a 10-minute walk along a grassy path through grassland heath and dunes to the beach. —Hughe's Thumb Road, the summer-only entrance (mid-June to mid-September), 1.2 miles (1.9 km) from Scrubby Neck Road to Hughe's Thumb Gatehouse. This entrance is wheelchair-accessible.